Patrick Roddie, best known for cosplaying as a professor, has traveled the country to lecture dozens of credulous believers about the chemtrails conspiracy theory and what he believes are the facts. Armed with a smart suit, a full beard, and an Irish brogue, his stentorian tone of voice in the majority of the videos in his YouTube channel shows an unsinkable confidence that he is a man who knows what he is talking about. Even if what he is saying is a pack of lies regarding contrails, he has adherents who hang on his every word. His most recent video, though, reveals a break in his facade of a polished, refined man of letters. As you can see, he is now without his usual slide deck, and his indoor lecture hall; his grand sweeping gestures are useless without a projector screen, and his sole visual aid is swiveling his phone in his hand to occasionally put the courthouse in the background. As a result, Patrick Roddie now looks exactly like what he is: a mentally disturbed man of no fixed address (and no website anymore apparently) ranting in the streets of San Francisco. Such is the hold he has on his followers that many will not believe that this dude just didn’t pay his bills and got kicked out of his place. He sounds crazy because he is being persecuted for his work speaking the truth of chemtrails, they say. The evil doctors and their Western (allopathic) medicine must have given him a dose of crazy pills in the hospital, they guess. He'll be right as rain, he just needs to do this video over in a relaxed frame of mind, they tell themselves. Then they will have a strong willed man who can tell them what to think again. 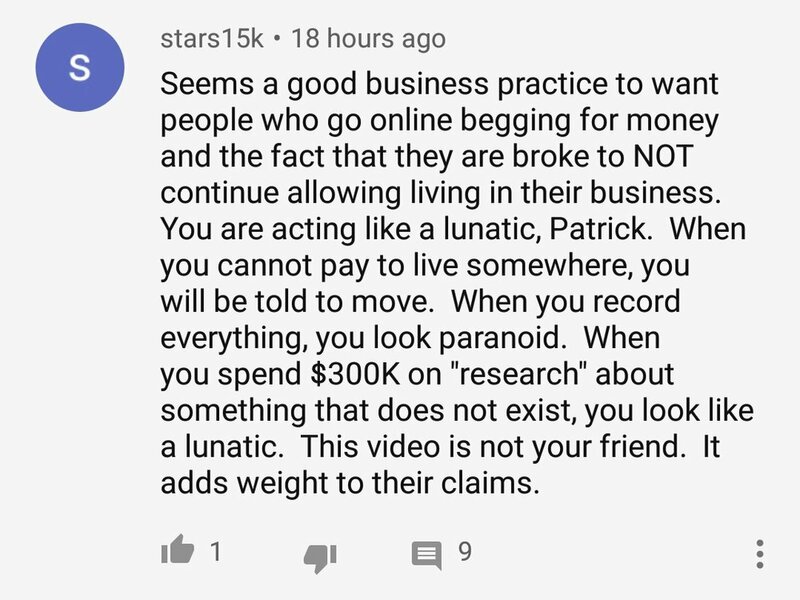 One person speaks up and says Patrick is being evicted because he can't pay rent, and he should accept the consequences and stop nattering on about conspiracies against him personally. Right away, the true believers descend upon the person who is making sense with insults and gross speculation. The commenter at the bottom believes he has delivered a biting insult by assuming that the voice of reason is not a believer in other conspiracy theories besides chemtrails. One such ‘secret truth’ is that the earth is flat. Another so-called ‘truth’ popular among these fools is that NASA has faked the entire space program, presumably to cover up the truth about the flat earth. We have seen this arc bend downward before, and once it started a downward turn, it hit rock bottom in a hurry. Michael J. Murphy, of no fixed address, in Inglewood, used to be a producer of “documentary” movies which purported to explain what was in the chemtrails: “What in the World are they Spraying?” is the most famous, and he is still raising funds for “An Unconventional Shade of Grey”. Those days of “MJM” living the life of a Hollywood Producer are long gone. Michael has apparently spent the $15,000 in funds he raised from donors on himself and his base needs, rather than on “An Unconventional Shade of Grey”; without a means to pay the rent, he lives out of doors. Michael makes up new stories to explain why he has repeatedly started over on day one of sobriety with no memory of the last three days and without his phone. He keeps a tally in his head, and now he is owed billions by the person or persons who keep stealing his memories, his smartphones, and his sleep schedule. He takes pains to point out that he is definitely not selling these phones. A surprise addition to his narrative was that record label owner and former pop star Mariah Carey is also kidnapped by the same bad guys who are taking advantage of Michael, so if you help MJM get his money back, there may also be a famous rich woman who will be appreciative. Not many people believe Michael by now, but it concerns us that the number of people who do believe him is still a positive non-zero number. Instead they reinforce his delusions and tell him that he’s just undergoing hard times because of his standing up for the truth. None of his so-called “truther family” have gone to the streets of Inglewood to check on him, much less try to get him some help. They believe that his problems are caused by chemtrails, or radio waves, or shadowy secret government agencies: all things that they’re powerless to prevail against. Conspiracy theory often disempowers people as the leaders of these movement tell adherents to “wake up and do something” or whatever. This is probably all our fault somehow. Cults use love-bombing as a way of fulfilling the deep need for approval which is found in lonely and vulnerable people. While the cult member feels like they are being helped, in reality, their trusting nature is being used against them, and they become used to repeating and reinforcing the shared beliefs of the cult in order to keep their new friends close. Worse still, if any mental illness symptoms surface in the cultists, they are seen as proof of the outside world acting against the cult. Rather than encouraging their members to seek therapy for their mental health problems, the cult instills a distrust of all modern (allopathic) medicine. There’s some chance that, at least in the case of the prominent propagandists of the movement, people don’t want to believe that their hero is completely off their nut. After all, if you had followed someone’s “work”, heaped praise on them for “exposing the truth”, and maybe even sent them money but it turns out that they were delusional the whole time… you might have to stop and consider that maybe you’re just not as far down the rabbit hole as they are. Newer PostThe Anti-Vaccine Cult As Holocaust Victims? WTF? Older PostDid Trump Billy Madison His Way Through School?